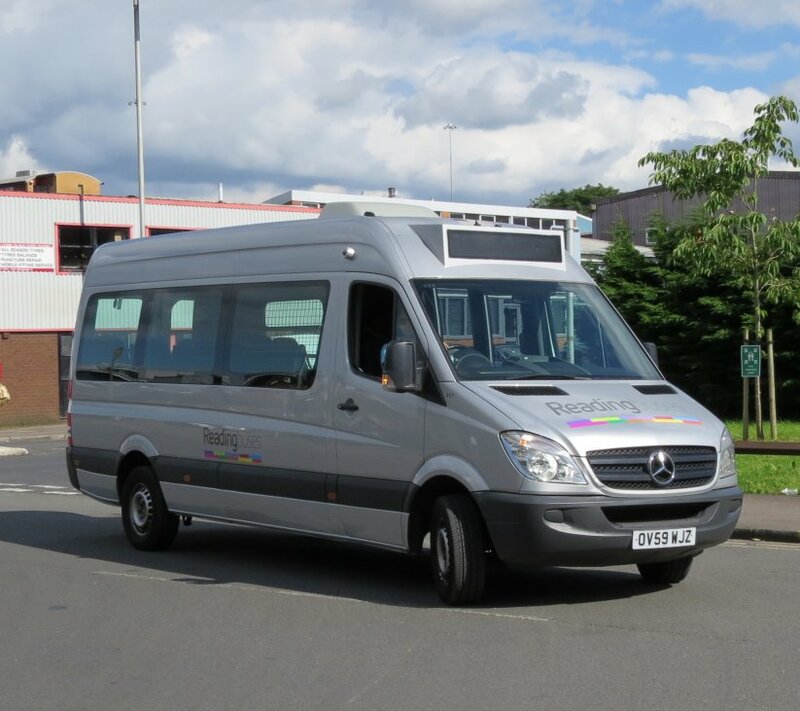 Aldermaston Coaches Fleet List: New in June was Mercedes Benz / Plaxton Y475 TSU. Thanks to Brian Coney for this. Baileys of Newbury Fleet List: New in September was Irizar i4 YN66 VYH and in November Irizar i6 YN66 VYJ. YT65 BYD is an i4 rather than an i6. Thanks to Brian Coney for this. Carousel Buses Fleet List: WVL26 transferred from Go-Ahead London Central in November to replace 101 which has been damaged by fire. 101/118/417 were sold to PVS Barnsley for scrap in December. 113 was donated to the Oxford Bus Museum, being converted back to dual door using parts form 114. 102/3/4/11/12/16/19 have been sold to Ensignbus (dealer) for likely scrap. 504 transferred to Thames Travel during 2016. Thanks to Ralph Adams for this. Courtney Buses Fleet List: New additions in July were Dennis Trident / Alexander ALX400 KV02 URS/USM. Volvo B7RLE BD14 KXZ had joined the fleet by July 2016. Optare Versa YJ64 DZL/M were sold to Optare (dealer) in January 2016. S853 DGX was sold by January, YJ57 XXE went in May, YJ62 FLD has been returned to Dawson Rentals by August and YJ08 PJU/V/Y returned to Dawson Rentals in September. KV02 URS returned to Dawson Rentals in August and KV02 USM / LR52 KVZ in September, apparently being short term loans for the summer. RO03 JVA left by April 2014, YJ55 BLV was returned to Dawson Rentals in August 2014, KX64 AED in approx January 2015, KP63 RHE in March 2015 and YJ08 PJO sometime in 2015. Thanks to Brian Coney for this. KV02 CCS appears to have been KV02 URS mis-reported. First Berkshire Fleet List: 44527/9 arrived at Slough from First Hampshire ahead of service changes from 24th September, and 44528, 64001/2 in November. 47405-8 also transferred to Slough from First Hampshire in December following success tendering for Surrey CC route 555 Heathrow – Hersham from 31st December. 68562 returned off loan from First Hampshire in February 2016. 66176 arrived from Hampshire in September for driver training duties, returning around 24th October. 23015 returned from overhaul by 24th November, allowing 20550 to be withdrawn by 27th November. Thanks to Brian Coney for this. 37275 transferred to Eastern Counties on 27 November 2015. Thanks to Richard Fuller for this. 901-6 are registered SK66 HRR/RU/RW/RX/RZ/SA. 901-3 were delivered in September, with 904 arriving by 9th October. Thanks to Brian Coney for this. 901 entered service on 28th September. Thanks to James Cusworth for this. 902/3 entered service on 28th September also, 905 on 30th. Thanks to Martin for this. 904 was in service on 14th October. Thanks to Ray Smith for this. 906 entered service on 5th November following display at the NEC from 1-3 November. 12 vehicles have been ordered to replace the Newbury Vodafone fleet, comprising of 2x ADL Enviro 400 MMCs, 4x Optare Solo SRs and 6x Scania Irizar i3 single deckers. The Scania order was announced at the Bus & Coach Live show at the NEC on 1st November. The new Optare Solo SRs for Vodafone are to carry fleet numbers 191-4 and are registered YJ66 AEX/Y/Z. 191 arrived on 15 December, followed by the others by the end of the month. The new Enviro 400s for Vodafone are to be 781/2 and registered SN66WRC/D. 782 had arrived by 24 December. 701-5 were delivered to Scania (dealer), Thatcham during December and stored there, apart from 704 which came to Reading (still untaxed) for driver training. 181 was delivered by low loader in original condition on 7th August, and parked in reserve with the original 184. 183 entered service on 18th October wearing it's original mark before being reregistered to RG05 BUS in November. 184 is now used sporadically on driver training duties still in Stagecoach livery, and was first noted as such on 30th September. 186 briefly carried number 181 prior to entering service, was reregistered RG55 BUS in September, and was seen on driver training duties on 29th September and in service on 30th. 1212 was in service by 7th October. Optare Versa 114 arrived from Dawson Rental to replace 111 shortly before 20 November. 521 was withdrawn by 9th October and 523 by 20th November, both departing soon after withdrawal. 850 went on loan to Somerbus on 3rd October until 804 was available for sale. It returned by 24 December. 851 was still in use on 9 November and was sold by 27 November. 852/3 were sold to Midland Classic on 2nd October. 854/5 were sold to PC Coaches of Lincoln, departing on 9th November - 855 still being in service on 5th. 856-9 have been sold to Wheelers, Southampton. 856/7 departing in late October, and 858/9 on 10th. 162 was repainted into Kennections livery during October, transferring to Newbury by 23rd October. 412 was repainted into Leopard livery from Scarlet in September 2016. 422 was being prepared for repaint at the end of October. It returned to service by 5th November in a Gold livery celebrating Chris Mears Olympic gold medal. 435 was reregistered BU52 GAS in September 2016, and was in service by 18th October. 651 carried Park & Sleigh Ride branding from 2nd December. Wright Streetdeck demonstrator SK65 PWV was returned on approx 5th August 2016. Wright Streetdeck demonstrator SN64 CTU was in use at Newbury from August using fleet number 107. It moved to Reading by 27 November and had left by around 30 November. Wright Streetdeck demonstrator 106 (SL15 ZGP) departed around 18th October. Volvo B7TL / Plaxton President W473 WGH was on loan from Ensignbus (dealer) from August 2016 to follow a bus in service on route 17 to gauge performance of its Vantage Power hybrid drive system. Alexander Dennis Enviro 400H City demonstrator 101 (SN65 OHP) arrived on around 7th October, and operated on route 17 with a fixed vinyl blind from 11th until 27th. Alexander Dennis Enviro 400H demonstrator 233 (SN63 VTX) arrived on extended loan on approx 21st October to provide additional warranty cover. Three Scania ND280 / Alexander Dennis Envrio400 MMC stock vehicles 775-7 arrived on loan from Scania in October pending delayed delivery of 701-5. The first arrived on 18th October, followed by the other two by 23rd. All three entered service on 24th October with Royal Blue logos on dealer white livery. Ensign Enterprise demonstrator LX66 GXE arrived on 20th November and departed on 1st December, and operated on route 17 from 21st November. 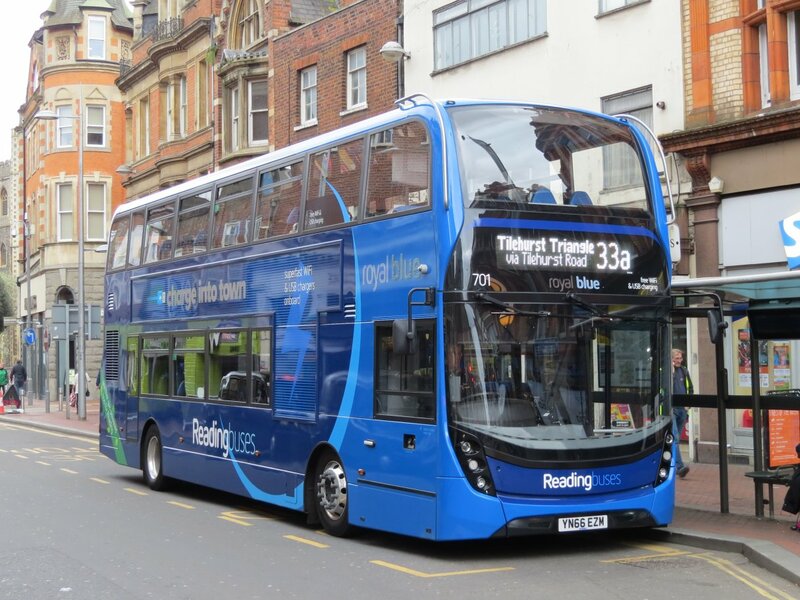 Reading Transport ADL Enviro 400s: 759 gained a colour bar in December 2015, followed by 758 in July 2016. Repainted 756/7 gained USB charging points upon repaint into route 33 livery, as did generic 758 at the same time. 203 had lost its name "Joan Taylor" by August 2015 following the front panel being replaced. 216 gained white LED destination displays in November. Reading Transport Optare Spectras: Former 726 passed from Stagecoach Norfolk Green to Bus of Hope, Newbury in March 2016, and was in use as a mobile resource centre by August 2016. Former 725/7 passed from Stagecoach Norfolk Green to Brecks Coaches via Southdown PSV in June 2016. Former 728 passed to Sergeants, entering service there on 30th December. 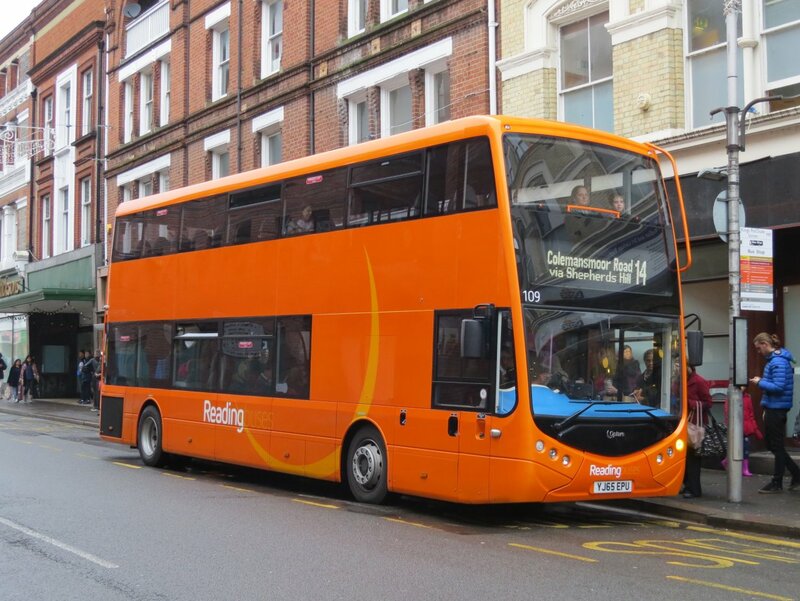 Reading Transport Scania OmniCity Double Decks: 1106 and 1112 lost their colour destination displays in favour of plain orange in November. Thanks to James Cusworth for this. 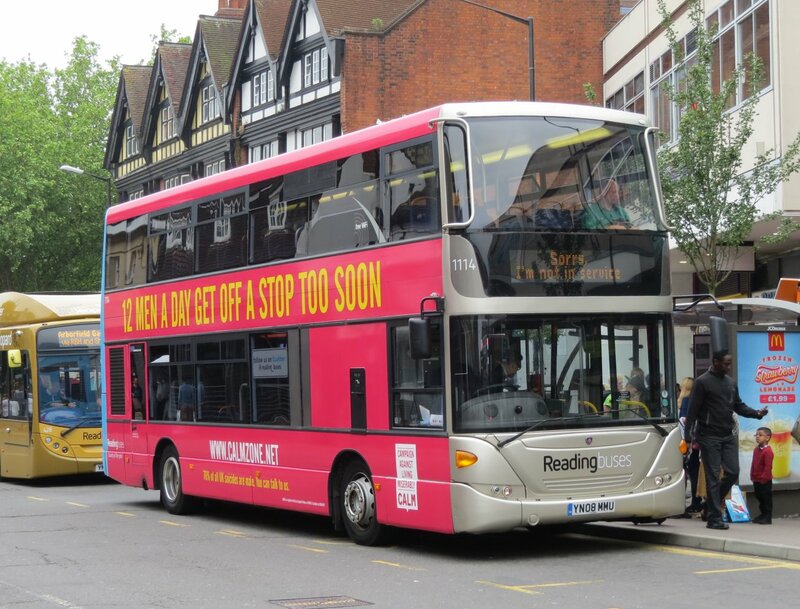 Reading Transport ColourBuses: 1114 has gained a new livery for this years Charity CALM - Campaign Against Living Miserably in January. 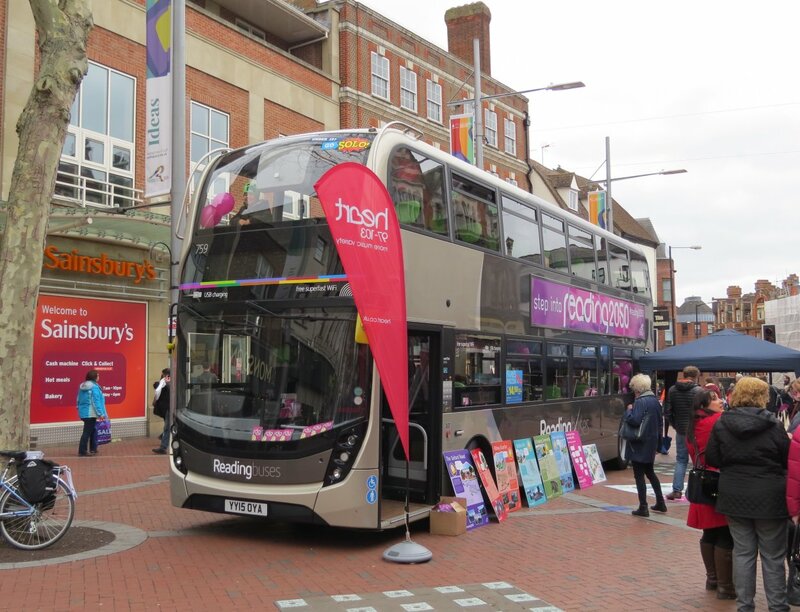 Reading Transport MegaRears: 208 gained a MegaRear for Festival Place, Basingstoke in November, replacing its rear for Pack Send. 231 gained a rear for the Oracle in December 2016 replacing its rear for Ebay. Thanks to James Cusworth for this. The rear on 1211 was in place by December 2015, rather than January 2016. 1102 gained an advert for Just Tiles on 4th December, presumably replacing recently sold 857. 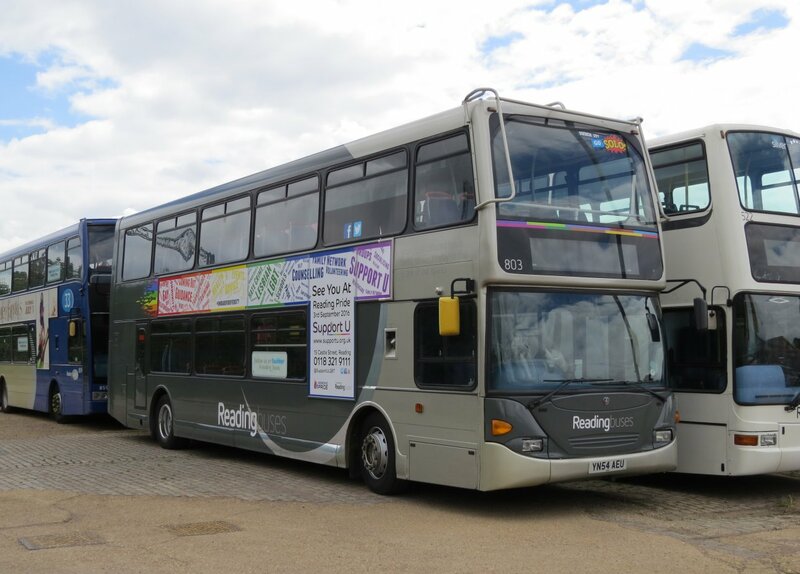 Reading & Wokingham Coaches Fleet List: New additions in September were Setra LL57 ZGK which was reregistered J222 RWC, and Volvo B12B / Plaxton Panther SF07 YTR was has been reregistered OVK 902. Citroen LD08 EVF was acquired in August 2015. Thanks to Brian Coney for this. Stewarts Coaches Fleet List: New in June was Irizar i8 YT16 FTZ, and in October Irizar i6 YN66 VXU. YN09 HZC was sold to South East Coaches in November. Thanks to Brian Coney for this. Thames Travel Fleet List: 994 is a grey Vauxhall Corsa saloon. Thanks to Alan Brampton for this. 701-8, 720/21 were withdrawn by 3 October with 701-8 transferred to Go North East. 716-19 followed in December 2016. Thanks to Ralph Adams for this. 828/30 appear to have returned off loan to Oxford Bus Company in around October 2015. New additions from Go-Ahead London Central in November were five Volvo B7TL / Wright Eclipse Gemini numbered 933-7 to replace Tridents 105/6/9/14/20 on schools work. 933-6 were from London Central and 937 from London General. 114 was sold to PVS Barnsley for scrap, and 105/6/9/20 to Engisnbus (dealer) for likely scrap. 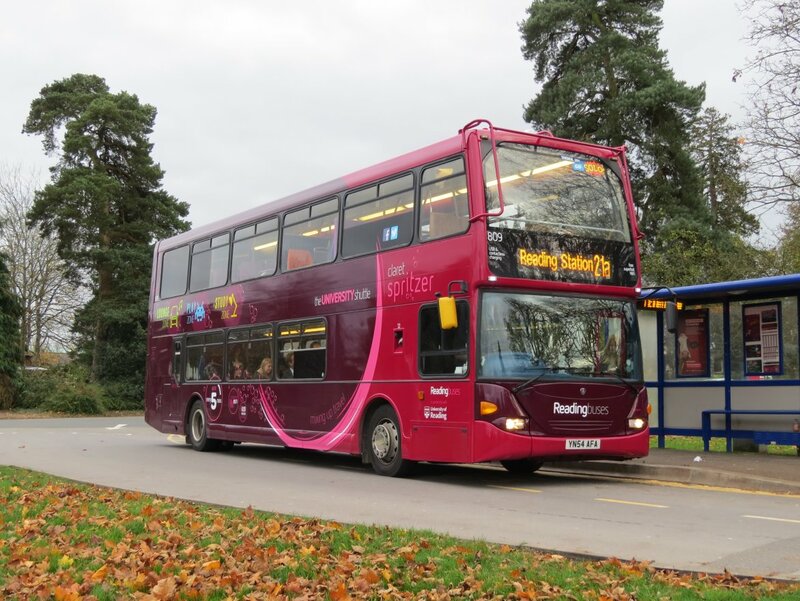 Weavaway Travel Fleet List: Following West Berkshire tender losses YY64 TYA-C and YX65 RWV/W received a modified Newbury and District bus livery in September featuring a greater red area and Kennet Bus lettering for new commercial services 1A/1C/1D between Newbury and Thatcham. C1/C3/C6 OXF, C16/20 TCL and YUE 338 regained their former registrations in September with the first four sold and the others advertised. Thanks to David Wilder for this. C2 OXF, C17 TCL and RF61 CYJ regained their original registrations in August. S764 SVU was sold to Boorman, Blunham in July, and RF61 CYJ was sold in August. Thanks to Brian Coney for this. YJ13 HMO has been repainted white pending sale and YX63 ZVJ/K have received Thames Valley lettering in place of Newbury & District. Volvo Olympians P730 GND, R511UWL, R740DRJ, S918ANH were sold in November. Thanks to Ralph Adams for this. New for the Park & Ride were 20 Wright Streetdecks that are likely to be numbered 662-681. 663/4/5/71 were in service by 31st December, with the others expected in January. Thanks to Ralph Adams for this. 214-222 were de-branded in December ahead of replacement by cascaded P&R vehicles and transferred to Carousel. 231 and 251-4 transferred to Thames Travel at the end of December. 305, 306, 316 lost their Park & Ride branding in early December ahead of replacement. 801 transferred in from Carousel in September and was renumbered 962 to form part of the training fleet. 828 was withdrawn following fire damage in November 2015, and stripped for spares at Thames Travel. Demonstrator 900 left in around July. Wright Streetdeck Demonstrator 932 SN64 CTU returned in December, previously having been with Reading Buses. Loaned coach 10 returned in November. Loaned Mercedes Tourismo BV66 GVJ is using fleet number 19. Stagecoach in Oxfordshire Fleet List: Exact dates for entry into service of 10675-83 added. Thanks to Ross Hitchcock for this. 10684-7 are SN66 WHC/D/E/G and were in service by 28 September. Thanks to Craig Meppem for this. 36765-7 transferred from Oxford to Banbury in October replacing 34436/7 and 34468. 36452/5 transferred to Stagecoach East Midlands in October. 12017/24 transferred to Stagecoach Manchester in September. Thanks to Ralph Adams for this. New are Stagecoach Gold 10779-80 at Oxford for routes 7, X30 and 31, entering service in December. 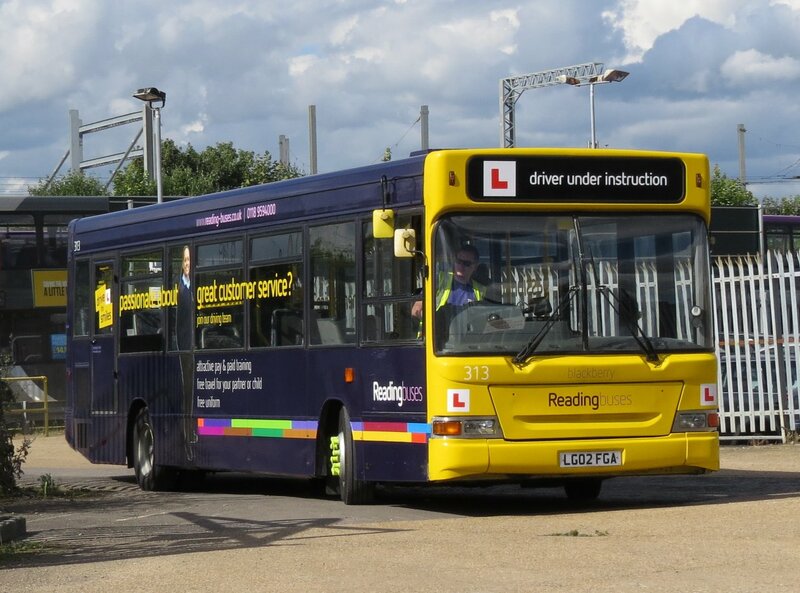 Reading Transport Fleet List: The gas Solos will not be numbered in age order, with YM55 SVL becoming 181 and YK05 CBV becoming 182. Neither have yet to enter service, while 183-6 will be stored for the time being. DU61 FVY is confirmed as 1212 and will be plain red to cover Kennections and Vodafone whilst DU62 FHK has become 1214 and is in Kennections livery and entered service on 5 September. Vehicles on short term loan for Kennections are Optare Versa YJ62 FLD numbered 110 and ADL Enviro 200s KX58 GUW/U numbered 111/112 all in plain white with Kennections logo, whilst 521/3 lost Silver Stars lettering in August and gained Kennections logos on their plain white livery for 5th September. 521/3 are expected to depart at the end of the month. Fleet numbers for the new Wright Streetdecks are to be 901-6, and the gas powered Enviro400 MMCs 701-5. Wright Streetlite SK65 PWV spent a week on evaluation in Newbury at the end of July. Thanks to Brian Coney for this. 2 has lost it's Vodafone livery and gained Kennections logos on it's plain red livery. Thanks to James Cusworth for this. 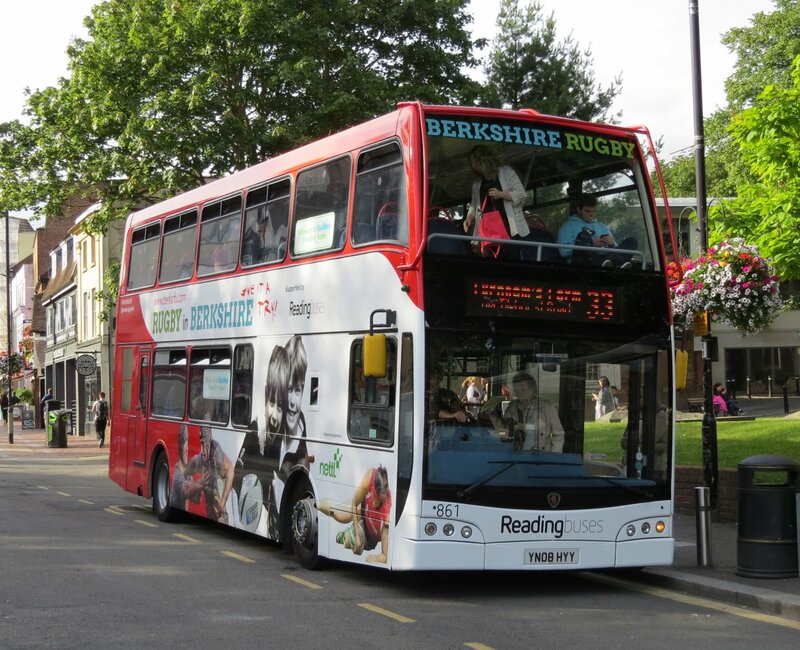 Reading Transport East Lancs Olympus: 861 has gained a full colour front destination display. Oxford Bus Company Fleet List: 873-5 have transferred in from Thames Travel. Mercedes Benz Tourismo BV66 GVJ is on loan. Thanks to Ralph Adams for this. Bus & Coach buyer reports that a number of Mercedes Citaros cascaded by new electric vehicles in London are expected. Thames Travel Fleet List: New are Wright Streetlites 441/2 in Connector livery for a service to Great Western Park, entering service on 5th. 207/08/30 have transferred in from Oxford Bus Company, and currently remain in red with Thames Travel fleet names. Thanks to Ralph Adams for this. Stagecoach in Oxfordshire Fleet List: 12018/19/21/25 departed for Manchester in late August followed by 12020/22 on 10th. Thanks to Ralph Adams for this. Exact dates into service for 10667-72/4/6 added. 12014-26 are in the process of being transferred to Stagecoach Manchester following delivery of the new vehicles, with the remaining batch 12001-13 to be concentrated on route 10 once deliveries later in the year are completed. 15994-6 have transferred to East Scotland and 15966 has transferred from Witney to Oxford. 36451 transferred from Oxford to Banbury and then to Stagecoach East Midlands along with 36453/4, 36763/74 transferred from Oxford to Banbury, 47451 from Witney into reserve and 47658 from Oxford to East Scotland. Banbury 34466 has been withdrawn for sale. 36981 has a new MegaRear for Fostering & Adoption in place of 36768. 36926 has lost its Headington Connect branding. 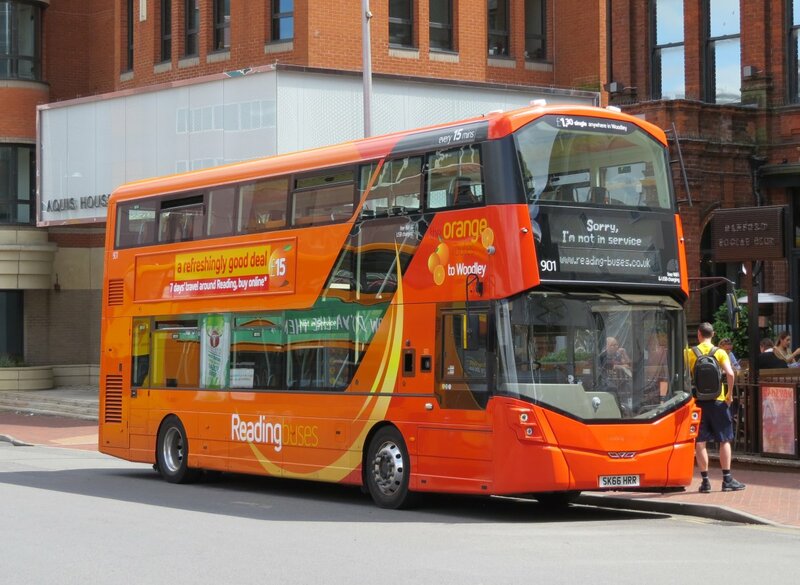 Reading Transport Fleet List: The gas powered Solos will be numbered 181-6. What is assumed to be 186 returned from repaint into generic silver on 22nd, whilst 183 was noted leaving Bus & Coach World Blackburn in generic silver the same day, and is therefore likely to have arrived today. 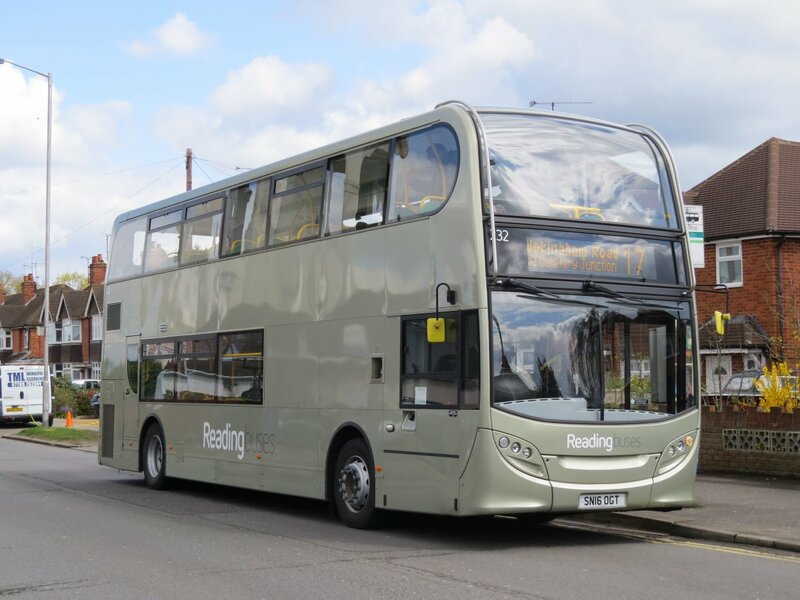 Reading Transport Fleet List: Wright Streetdeck demonstrator 106 has returned for another period on loan, and was in service on the 13/14 today. Thanks to Martin for this. Courtney Buses Fleet List: Dennis Trident / Plaxton President LR52 KVZ has joined the fleet (this was formerly Reading Transport 522). Oxford Bus Company Fleet List: 12 and 91-99 left the fleet last year. Vans 955 and FY13 KXF have left the fleet, 984/5 have replaced 986/7 and 999 has been replaced. Weavaway Travel Fleet List: YJ13 HJO has been repainted plain white prior to disposal with YJ13 HMO to follow by the end of the month. YX65 ZJN has been rebranded Haywards from Tappins. C18 TCL has been reregistered S772 RVU and sold. Thanks to David Wilder for this. Reading Transport Fleet List: Gas powered Optare Solos FX04 WFR/V, YK05 CBV, YM55 SVK/L were acquired from Stagecoach East Midlands in June. YM55 SVJ which arrived on loan in February has also been acquired. All six are currently undergoing heavy refurbishment to replace most of the Wright Streetlites which will be repainted into Kennections livery for Newbury. Optare Versa YJ62 FLD and two other Versas are expected on loan to provide cover in Newbury alongside 521/3 and 1031 pending their entry into service. 522 departed for Milton Keynes on 16th with YJ62 FLD returning in the opposite direction. The other two Versas are expected on 23rd. Also acquired for Kennections are Alexander Dennis Enviro 400 DU61 FVY (ex GO60 ODY, LC61 WYN) and DU62 FHK (ex LA60 ODY, LC62 WYN) which arrived from Go Goodwins on 15th. 161 had returned from repaint into base Kennections livery by 18 August. YT13 YUK has returned from repaint and been allocated fleet number 435. Reading Transport Dennis Dart SLFs: 310 spent a week around 9 July on loan to Thamesdown Transport. Oxford Bus Company Fleet List: Volvo / Plaxton Elite SH61 HGU is on loan as fleet number 10, formerly of Parks of Hamilton in base Citylink Gold livery with Airline logos. Thanks to Ralph Adams for this. Stagecoach in Oxfordshire Fleet List: 10667/70/71 entered service by 16th and 10669 by 19th. 12001-13 are expected to transfer to Stagecoach Manchester once this batch are in service. Thanks to Ralph Adams for this. 12015/16/23/26 were observed on the way to Manchester on 20th. Weavaway Travel Fleet List: YN12 BDV/BNV have been sold to Plaxton (dealer) following the arrival of PO16 CCU/V. BKZ 70 has been rebranded from Weavaway to Abingdon Coaches and YX65 ZJO has been rebranded from Tappins to Countywide. Thanks to David Wilder for this. Reading & Wokingham Coaches Fleet List: The report of MT61 HVE / T2 RWC being acquired appears mistaken as it is currently with Chenery Travel. A King Long "XMQ6129Y" registered BX14 KPE has however joined the fleet from Globe Holidays, as has Volvo B11R/ Jonkheere BT14 DLK from Webberbus. Meanwhile K346 OFM passed to Intelligent Waste Management Ltd in July for conversion into a mobile office. News Page: Catching up "In Short" with photos of 109, 206, 232, 803, 806, 856, 757, 758, 759 and 1208. Demonstrator YT13 YUK has been acquired and is currently being repainted into generic silver prior to entering service. It was previously used on loan from December 2013 until February 2014 as fleet number 400. Four further DAF DB250 / Wright Gemini 527-30 were acquired from Ensignbus (dealer) in February for single door conversion and repaint. 527-9 returned during April in silver stars livery with 528/9 entering service in May. A more extensive refurbishment took place on 530, gaining registration X100 RDG in May and entering service on 5 July in generic silver. A new addition on 28 December was Mercedes Benz Sprinter 357 from Ventura Coaches Sales (dealer) for staff shuttle work in plain silver with Reading Buses logos. On order for 6 Wright Streetdeck vehicles was placed in March for the Woodley routes for delivery over the summer to re-launch the 13/14 in September, followed in April by an order for the very first 5 gas powered Scania N280UD / Alexander Dennis Enviro 400 MMC for route 33 and delivery in early October. Disposals: 551/3/8/9 were sold to Ventura Coach Sales (dealer) on 28 December, and 557/69 in February. 849/60 were sold to Wealdon PSV sometime between Christmas and New Year. Wright Streetlite wheel forward demonstrator SK65 PWV arrived on 24 July for demonstration in Newbury. Alexander Dennis Enviro 400H SN16 OGT arrived in on 19 March on loan term loan to cover for warranty repairs on 751-74, and has been given temporary fleet number 232. It entered service on 8 April. Gas powered Optare Solo YM55 SVJ arrived on loan from Stagecoach in Lincolnshire on 17 February to assess smaller gas buses are suitable for some of the quieter routes, and possibly for pioneering routes into some of the new housing areas coming on stream over the next few years. It is being refurbished and repainted into generic silver over the summer. Scania K250 / Irizar i6 demonstrator YP64 WVW arrived on 1 February and used on Vodafone services in Newbury, returning to Scania on 1 March. Wright Streetdeck 106 left for the second time on around 3 December, before arriving for a third visit on 6 April until approx 17 May for more detailed testing that will determine how the final specification for the new buses is drawn up, in particular the best gearbox settings for fuel economy, and the suspension damper settings for best ride quality. It used the same fleet number during these periods bit it was not shown on the vehicle. Optare Metrodecker demonstrator YJ65 EPU arrived for an anticipated six week period on loan by 3 December and entered service on 18 December carrying fleet number 109. It went to Newbury on 11 January for a couple of weeks before returning to Reading for further service prior to return on 4 March. Livery: 849 lost its temporary Claret Spritzer branding in November prior to sale and withdrawal in December. 526 returned from repaint into generic silver / Silver Stars livery in December returning to service by 11th, and 553/59/69 lost their Green Bus branding in December with the other three to follow. 569 was returned to service in January having been in reserve since October, seeing sporadic use along with 557. 209 was repainted from generic silver into Lion livery in February. 756 was repainted into Royal Blue livery for route 33 in May followed by 757 in June following reductions to route 21 from 11 April. 1114 lost its ColourBus livery for Alzheimer's Society in December to receive a new livery for CALM (Campaing Against Living Miserably) the company's 2016 charity of the year. 1208 was repainted into original Reading Buses cream and maroon livery with aquamarine stripe in July with lettering to celebrate 30 years of deregulation, re-entering service on 4 July. The front of the ColourBus livery on 861 was removed and put into Sky Blue by 20 July for the extension of route 15 to IKEA, making the vehicle part of the Sky Blue fleet rather than generic. Thanks to Brian Coney and James Cusworth for this. 205 has been away since at least March at Magtec for the installation of a plug-in-electric drivetrain with a sub-1000cc on-board Compressed Natural Gas (CNG) engine to extend the range of the bus. A second example is having a Vantage Power series-hybrid system fitted, bringing stop-start and selective zero emission running capability. The batteries in the E400Hs have a 5-year warranty, so these trials are being carried out under a scheme supported by the DfT's Clean Vehicle Technology Fund as alternatives to direct replacements. Reading Transport MegaRears: In January 1211 gained a new rear for Just Tiles, and in April 415 gained a new rear for Swansea University. 1208/9 lost their rears for University of West London by 12 February. Thanks to James Cusworth for this. New photos of rears on 220 added. 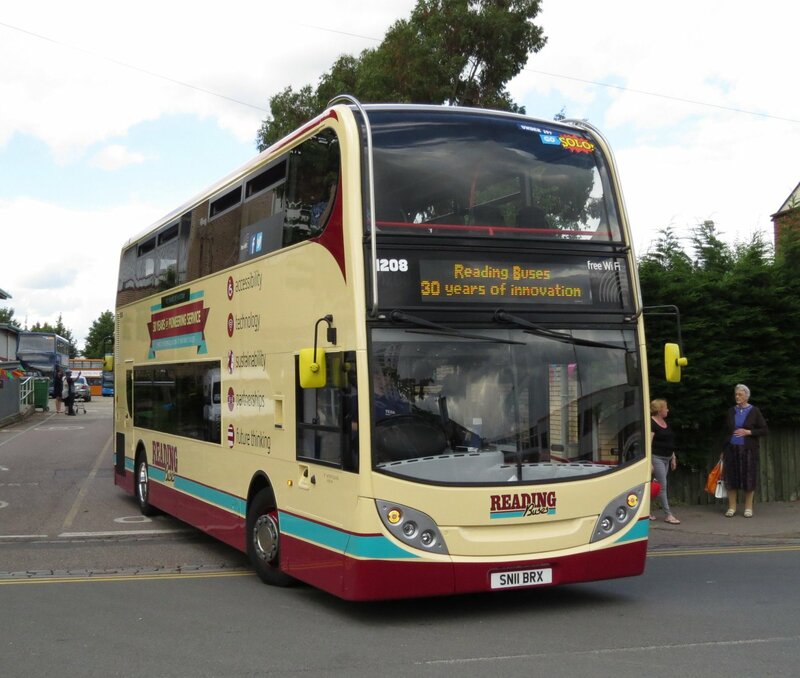 Reading Transport Greenwave Rears: New photo of the Mereoak Park & Ride rear on 402 added. 407 retains it's Madejski Park & Ride rather than having been changed to Mereoak. 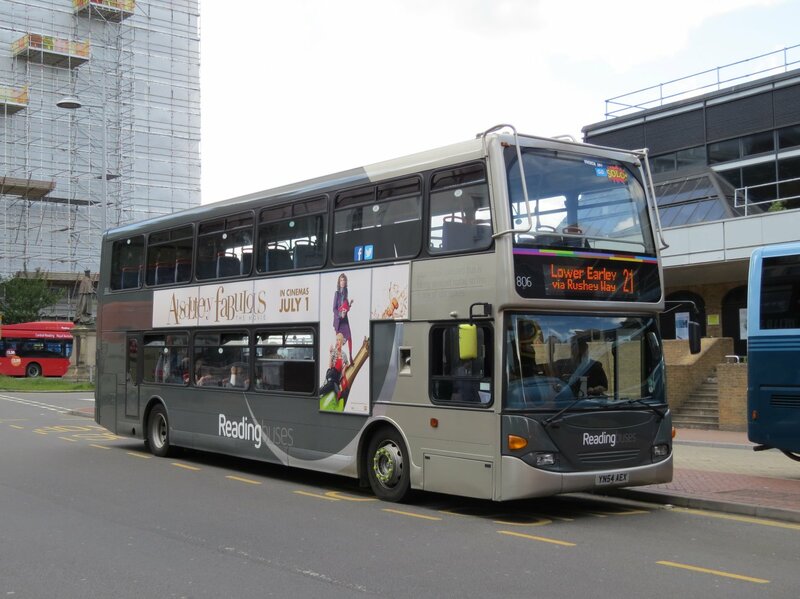 Reading Transport ADL Envrio 400Hs: 223 gained a full colour front destination display in March. Thanks to James Cusworth for this. Aldermaston Coaches Fleet List: A new addition in April was SW61 LHD from Andrews Coaches which has been given fleet number 6. The existing 6 has presumably been renumbered. Thanks to Brian Coney for this. Baileys of Newbury Fleet List: New in April/October were further MAN / MobiPeople Explorers PO15 GUF/E. Irizar i6 YN62 CXC was acquired from Peakes Coaches, Pontypool in November 2014, followed by a new example YT65 BYD in November 2015. Thanks to Brian Coney for this. Carousel Buses Fleet List: 403-5 arrived in November registered SM65 LNE/F/G and gained temporary Park & Ride branding from 1 February. 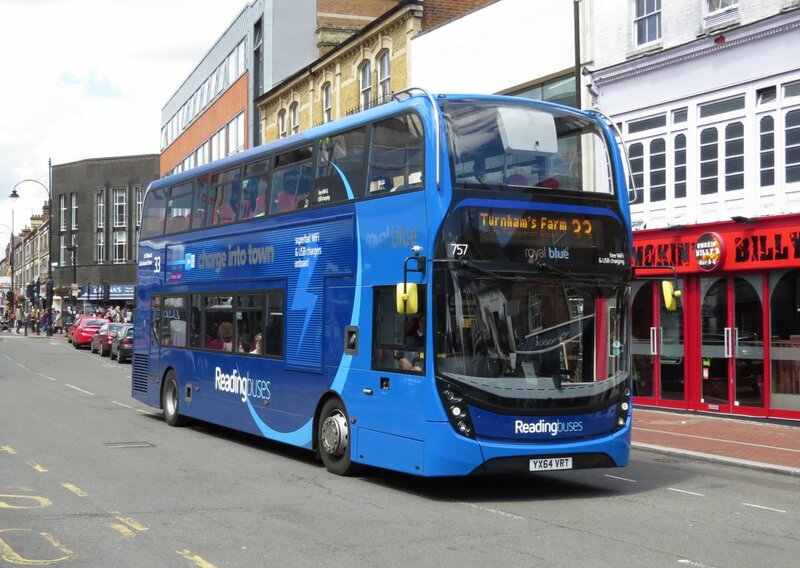 They then gained Link branding at the end of May and Regatta X80 branding for their new High Wycombe - Reading service from 25 July. A further example 406 arrived on 29 March registered SK16 GXL in Carousel Link livery, and three more 407-9 on 23 May registered SK16 GXX/Y/Z. 809 returned to service in January with 801 going into reserve. Reserve 415 was sold in around March and 417 was withdrawn for sale at the end of May after seeing some use. Thanks to Martin and James Cusworth for this. Courtney Buses Fleet List: New in November were Optare Versas YJ65 EVM/N in dark green route 194 livery, followed by Volvo B8RLE / Wright Eclipse Urban 2s BU16 UYC/D in March initially plain silver, and then with Chineham Park livery added. Further acquisitions in March were Volvo B7RLE / Wright Eclipse 2 BD14 KXU/X/Y and BG14 OPB/E from Malta Transport Services in dark green for route 194 apart from KXU which is plain white. KX10 DVJ was sold to CT Plus by February. Thanks to Brian Coney for this. First Berkshire Fleet List: 44530-3 transferred in from First Hampshire & Dorset in December with 44502-5 transferring to First Cymru. 63313-16 entered service during December with Fast X74 branding allowing 42673 to be withdrawn in November and 41336/42341 in December. 41336 may have been sold for preservation, and 42341/6, 42656/73 departed in March probably for scrap. Open top Volvo Olympian 34258 arrived from Hampshire in March for use on the Legoland shuttle over the spring returning in June. 20807 was repainted into the the RailAir & you're there livery with Cheltenham to Chicago rear in November and 20808 Newbury to New York in December. 33179/81 gained Legoland lettering in April. 37275 followed 37274 to First Eastern Counties in December. 39810 went into storage at Hoeford in December for the winter returning by 6 May. 23015 went away to Hoeford depot on 1 March for a major overhaul. 20550 remains in use in it's place. Thanks to Brian Coney for this. Horseman Coaches Fleet List: Acquired from Plaxton (dealer) in March 2016 was Volvo B11R / Plaxton Panther 2 YX15 OUU and Volvo B8R / Plaxton YX16 NWL. New additions in November were Volvo B9 / Plaxton Elites NJ12 BUA / SO12 WJC from Parks of Hamilton. S192/3 WAN, S484 JKT and T10/20 DBM were sold to Plaxton (dealer) in November, all passing Reays of Wigton in January. W56/57 SJH were sold to Plaxton (dealer) in March. YN09 HRG was sold to Plaxton (dealer) in March. Thanks to Brian Coney for this. New Vehicles: Brand new in January was MAN 19.290 / MobiPeople Explorer PO65 FMG followed by MAN TGL / MobiPeople Midi Explorer PO16 HRZ in March. Further new additions in March were Neoplan Cityliner MT61 HVE from Ellinsons which has been reregistered T2 RWC, and in April CXZ 4801. Reregistrations: YN06 FTU has been reregistered to SIL 6303, YX10 FFS to XIL 7396, PN08 CME to XIL 7398 (January), YT09 BJZ to XIL 7398 (April) and WH04 OXO to FJ07 VWP (April). Disposals: In February X812 XEX was sold to Hughes, Llangefni and PN08 CME to Holmeswood Coaches. FJ07 VWP had departed by July. Thanks to Brian Coney for this. Stewarts of Mortimer Fleet List: New in July 2015 were Mercedes-Benz Atego / Unvi Voyager PO15 AZG/J followed by PO65 EZF in October and Irizar i6s YS65 ATN in January 2016 and YT16 FUA in March 2016. YN60 FMC/D were sold to Brentwood Coaches in October and November, and ANZ 4444 to Irizar (dealer) in June. Thanks to Brian Coney for this. Thames Travel Fleet List: 873-5 have transferred in from Carousel Buses following the delivery of Streetlites. Thanks to John Hammond for this. 504 transferred to Carousel in October, but came back on loan. 505 followed in March, entering service in full Carousel livery on 25 March. Thanks to Malcolm Crowe for this. New Vehicles: 21 new vehicles are on order for 2016. New in January were Alexander Dennis Enviro 200s YX65 RWV/W with South Midland branding at Didcot replacing YX62 EDO/P. Also new in January were Volvo B8R / Plaxton Leopards YX65 ZJK/N/O with Tappins branding and VanHool TX Astromegas V11 OCL/OOL with Weavaway/Tappins branding respectively. New in March were Mercedes Benz Atego / Unvi Voyagers PO16 CCD/E/F branded for Abingdon Coaches/Tappins/Weavaway respectively, and Alexander Dennis Enviro 400 MMCs SN16 OHA-H/J/K/L/O with Newbury & District branding on A-F and the rest with South Midland branding. Further Unvi Voyagers arrived in July registered PO16 CCU/V with CCU branded for Heywards and CCV for Countywide. A new addition in October was Leyland Atlantian open topper GRS 114E which has been reregistered LTZ 4567. BF/CF/DF/EF53 OXF were sold to Plaxton (dealer) in December and RH62 OHC/D to Airlynx Express, North Baddelsey in January. Rebranding: YJ13 HHV-Z have had Basingstoke Area Rapid Transit branding added in place of Space Shuttle. Reregistrations: R9 BRD was reregistered to SF56 TYT, S222 AJW to MC07 YDK, NE06 LAN to SF07 YDC and NE07 LAN to SF07 YDB in March. 653 GBU was reregistered RX12 HWK in April. Y8 OVA was reregistered R9 BRD in July. Disposals: YX62 EDO/P were withdrawn in December and sold to Plaxton (dealer). SF56 TYT, MC07 YDK, PO13 LLE/F were sold to Plaxton (dealer) and SF13 FPA/C to Taylor Coach Sales (dealer) in April. SF07 YDB/C and RX12 HWK were also sold in April. C4/5/7 OXF and C18/20 TCL were withdrawn in May and YN13 AWY had been sold by June. Thanks to Brian Coney and Ralph Adams for this. White Bus Fleet List: New in December was Volvo B8R / Plaxton Panther 2 YY65 WUA followed by similar YX16 NWB in April. Thanks to Brian Coney for this. Oxford Bus Company Fleet List: Four additional Plaxton Elite is arrived for the X90 numbered 67-70 allowing 61-64 to be repainted into Airline livery, allowing 21-25 to run a new service from Oxford to Birmingham Airport from 2 July. 226-8 were repainted into blue City 2 livery by the end of December, followed by 229 in March. 317 has gained cycle bays in addition to 316. 231 has gained a ColourBus livery for the Airline ahead of the launch of the Birmingham Airport service, returning to service on 27 April. 302 gained a new MegaRear for the NHS in April and 43 for Resorts World Birmingham in July. Thanks to Malcolm Crowe for this. Wright Streetdeck demonstrator SN64 CTL arrived on loan in March, entering service on 11th. It was previously with Go North East Thanks to Ralph Adams for this. It moved on to Plymouth Citybus in July. Stagecoach in Oxfordshire Fleet List: 47831-3 transferred from Banbury to Witney and 47834 to Oxford in January to meet Oxford LEZ requirements. 47452/453/658 transferred from Witney to Banbury and 47454 from Oxford to Banbury in return. Following Oxfordshire County Council tender cuts from Thursday 21 July Witney 47237/239/394/395/449/450, Banbury 47452/453/455 and reserve 47454 all transferred to Stagecoach Cumbria and North Lancashire, 47735/6 transferred from Oxford to Banbury, 47658 from Banbury to Oxford and 47834 from Oxford to Witney. Reserve 22761-4 transferred to Stagecoach Cumbria and North Lancashire in January, and 34470 moved to disposal in February and left the fleet. Reserve 47238 had gone for scrap by June. 94038 replaced 90838 in June 2015, and then transferred to Banbury in February 2016 being replaced in Oxford by 91567. 90159 replaced 90164 in January 2016, and an additional crew car was added at Oxford in April numbered 91652 and a Ford Transit 93069 to replace Optare Solos on these duties. 36448-50 are confirmed as having lost their route 500 branding. YJ61 JHV was on temporary loan from Optare January-April to cover warranty work on the Solo SRs, and was used on Oxford staff transport duties only. On order are ADL Enviro 400 MMCs 10667-87 due in the autumn and 10779-88 due next spring.